NOTE: I apologize to anyone who looked at the blog earlier today. There were technical issues with the photos! We had the perfect ice storm earlier this week...just enough to coat the trees. The roads were fine. They didn't even close the schools (which is saying something since they close the schools for the threat of a storm. 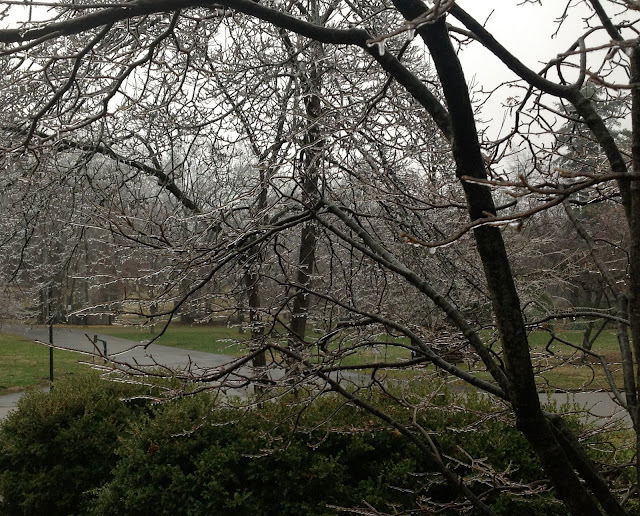 )﻿ This is the view from my front porch. There is a historic house across the street. 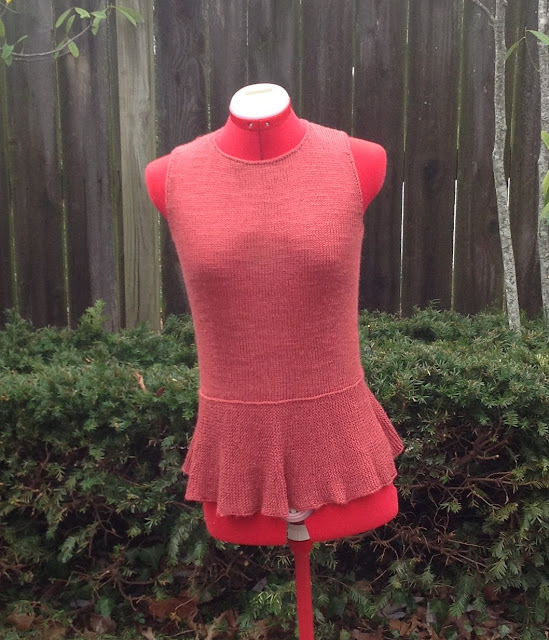 I had a busy week finishing up the dress and the peplum blouse. I also finished the patterns and the schematics. Again, I think my students know when I am going to have a busy week and hold off sending lessons in. I reviewed just three lessons this week. Something came up this week which has happened before. If you order a course from me and you don't get an email within 2 or 3 days, there is something wrong. I send out the materials the same day I get the order from TKGA. Sometimes there is a lag on their side. If you don't hear from me, either contact me or TKGA. My policy is to process orders immediately and review lessons the day I get them. (If I don't, I tend to forget about them!) The only exception is if I am out of town. I can still send out the materials for the courses since I take my iPad. I plan to get started on the Finishing Class next week. There was a question about the course on Ravelry. The course covers the same finishing techniques tested in Level 2 of the Masters Program. I will provide the students with a very thorough reference document for each lesson. It will have lots of labeled photographs similar to those I post here. You don't have to be doing the Masters Program to take the Finishing Class--just the desire to know how to finish. I have been a textiles judge at the Kentucky State Fair and I have noticed that the majority of the knitted articles have not been finished properly. It really detracts from the appearance of the garment. 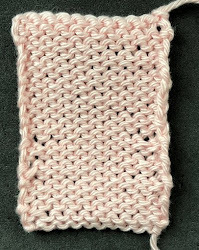 You can be the best knitter in the world but if the finishing is sloppy the object looks "homemade" instead of "handmade". As promised the tip this week is about provisional cast ons and picot hems. There are many uses for provisional cast ons but I will focus on just one. 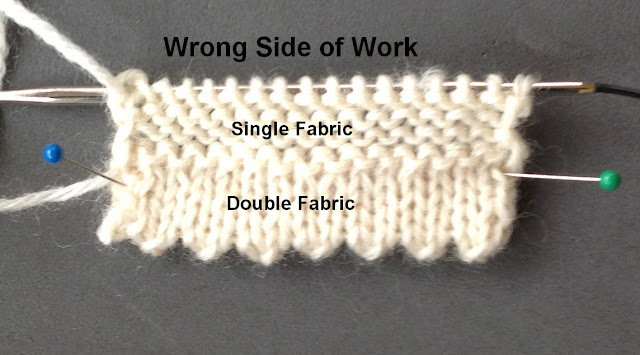 If you want a double hem, you can use the technique demonstrated last week. As I mentioned earlier a drawback of that technique is that if the cast on is tight, the piece will not stretch. This could be a problem for a hat. 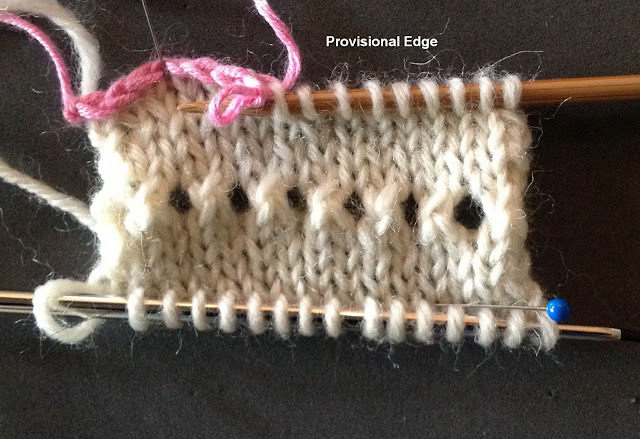 Also, a provisional cast on is easier to see than the cast on edge, particularly if you are using a dark yarn. 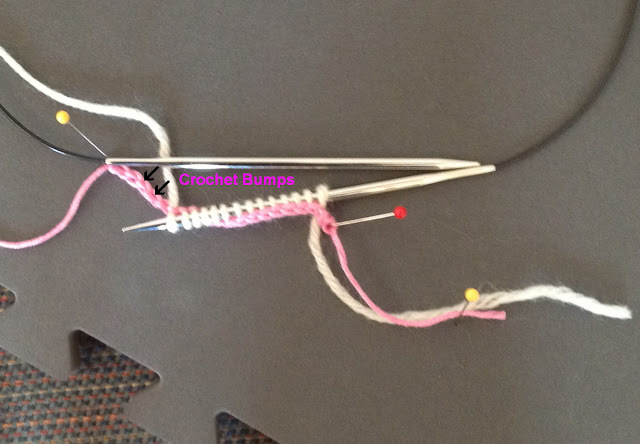 The easiest way to do a provisional cast on is to crochet a chain and pick up stitches on the back of the chain. Using a slippery yarn and a largish crochet hook, make a chain that has at least ONE stitch more than the number of stitches you want to cast on. In the photograph below I have arrows marking the bumps. I apologize for the color of the text which is unreadable. When you make your crochet chain, be sure you know which end is which. If you start at the end with the last chain, it should just unravel. If you start at the beginning end, good luck. You will wind up cutting it out. I generally cut the yarn tail at the end very short or tie a knot in it so I can tell them apart. When you are ready to work the stitches from the cast on, you put them on a needle. The photo shows the needle being inserted into the stitch below the crochet chain. The photos show the front and back. A picot edge can provide an interesting hem line, cuff or hat edge. I frequently use them in baby projects. It is very easy to do. You need a multiple of two stitches. You work to the where you want the fold line and work as follows for something in the round: *k2tog, yo; rep from *. If you are working flat, you need a selvedge stitches on each side so you would work as follows: k1, *k2tog, yo; repeat from * to last st, k1. 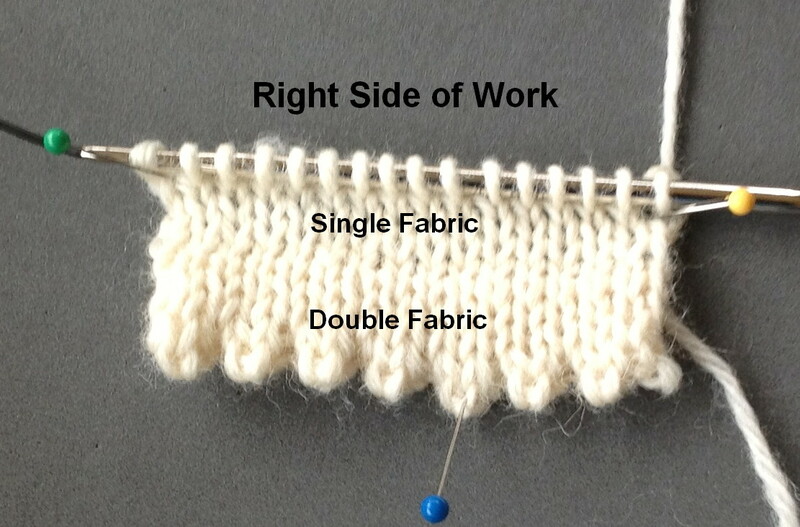 You then fold the piece and you can pick up stitches along the cast on edge or do a provisional cast on. There is an opera on Saturday--Donizetti's Maria Stuarda. Donizetti loved tragic queens. The Met did his Anna Bolena last year. I had to check the plot. I had this image of Mary Queen of Scots head singing after she's been beheaded. It is opera after all. The good news is that the opera ends with her ascending the scaffold. Salon will be on Sunday from 2-5pm. I was surprised at how quickly I could finish the dress and blouse. I wanted clean, classic looks and I think that is what I got. I am quite pleased. Not a very good picture but you get the idea. For aesthetic reasons I did a very narrow band (the pick row, a knit row, and a bind off) for the neckline and armhole edges of the blouse. It worked out very nicely. 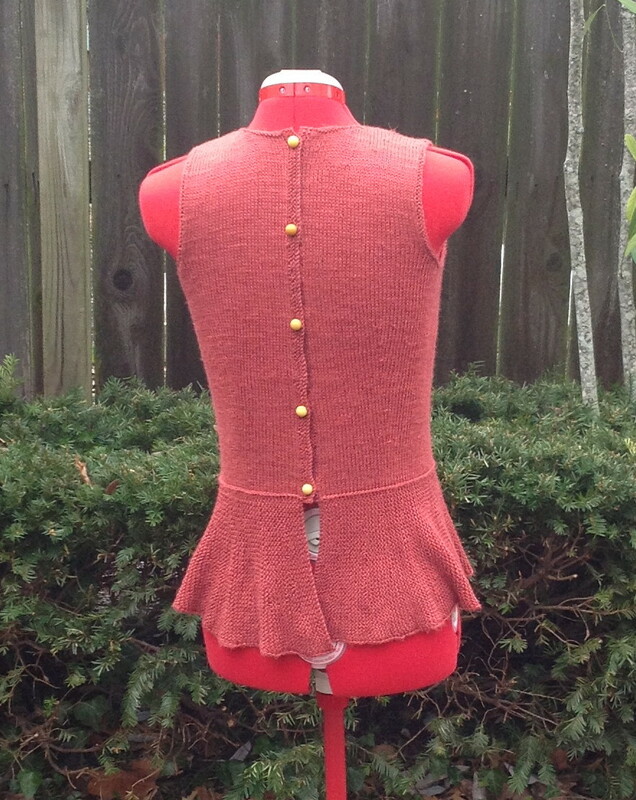 I also sacrificed (sniff) some of my vintage bakelite buttons for the blouse. I was tempted to ask for them back but that would be tacky. The yarn for the blouse is Classic Elite Firefly. It has a lovely sheen and the drape is nice as well. Here are the front and back. What you can't really see is that the peplum is garter stitch with short rows. I'm working on the last thing for the magazine...a pair of socks. I was going to do them in trinity stitch since that is the pattern stitch for the Stitch Anatomy lesson. There are so many trinity stitch garments in the issue already I changed my mind. I was inspired by a pattern in one of the Japanese books. I made some modifications. I'm going to call it Baby Bee Rib. I will post the photo next week. I don't see the pictures on the blog post. I see them on the rest of your posts. Just thought I would let you know.